I am not a fan of Korean drama series. But of course, almost anyone who heard of Korean drama series have heard of Winter Sonata which was one of the hit series that brought Korean drama series to fame. The famous romance series started off with the male lead, Joon Sang moving to a rural city of Chuncheon. Chuncheon is the "gateway" city to Nami Island. We were very fortunate that our Korean friend, Romeo and his gf had so kindly offered to bring us to Nami Island. On our way, we stopped by for Dak Galbi lunch. 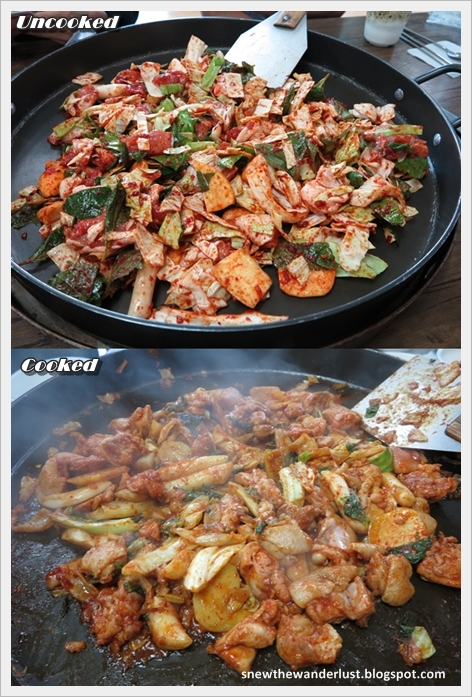 Dak Galbi was originated from Chuncheon. Dak Galbi is a popular Korean dish, made with stir-fry diced chicken in cabbage, sweet potato and Ddeokbokki (Korean rice cake), mixed in chilli pepper paste. As we could not take too spicy, Romeo instructed them to prepare it less spicy. The ingredients are prepared in a large hotplate and you have to fry it for 10-15 minutes before they are cooked. The taste was delicious and it was not too spicy for us. 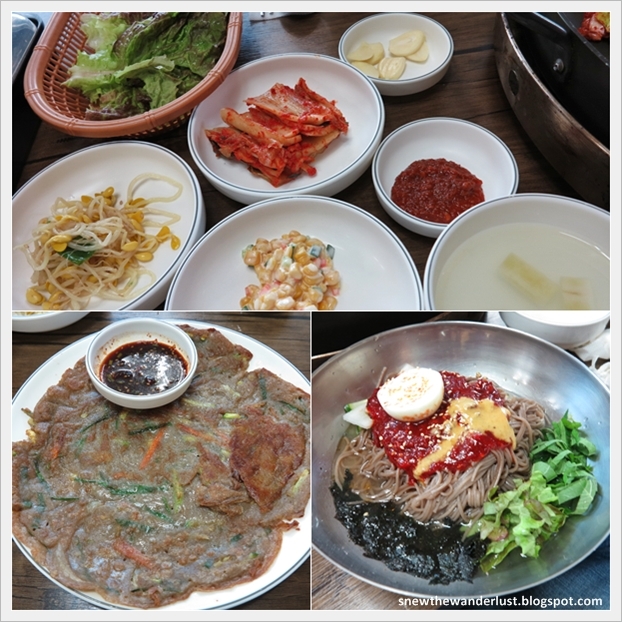 We also ordered Pajeon - Korean pancake and cold noodles. Of course, every meal comes with the sides dishes - Kimchi and the rest. The cold noodles may look spicy, but it is just sweet sauce. Very yummy as well. 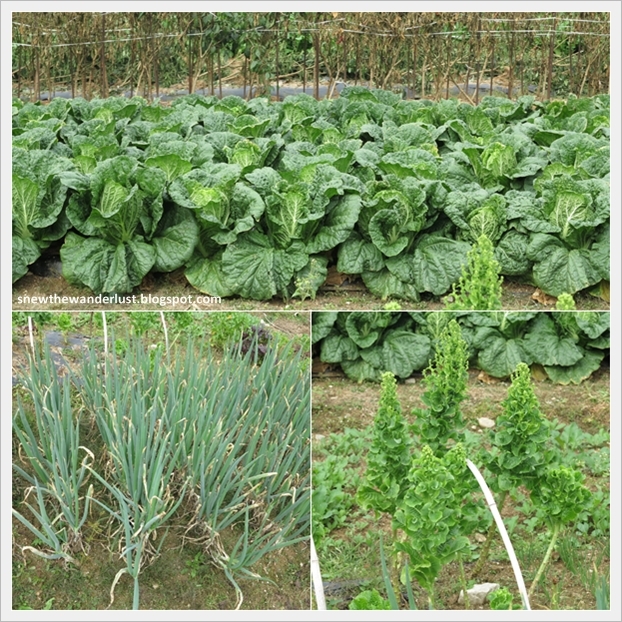 Just outside the restaurant, we saw the lettuce growing on empty plot of land. Perhaps, that's where the restaurant get their vegetables! Just like any barbequed meat, dak galbi can be eaten, wrapped in the lettuce. Lastly, we reserved some dak galbi to be fried rice. We order plain rice and just pour it in to mix it with the leftover dak galbi, and it turns out to be another dish - Fried rice! We were very grateful that our Korean friend drove us there. I am not sure how to get there by public transport as it is a very localised eatery. However, I saw some tour groups stopping there for lunch as well. I was told that this is the place that started the original Dak Galbi. No wonder it is so yummy. There are many Dak Galbi restaurants just outside the Nami Island ferry terminal. However, they are very touristy and doesn't look authentic. I read somewhere in the internet that there's a Chuncheon Myeongdong Dak Galbi Street. I am confused if this is a street in Chuncheon, or in Myeongdong itself. If you have the answer, do drop me a comment. (Apologies, I do not have the details in English). But I do hope that this business card do provide some help.